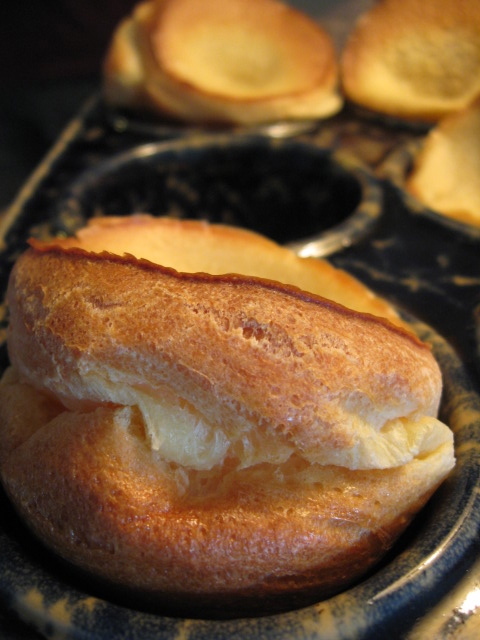 Popovers in all their particularity–and fullness. I hadn’t ever eaten them, I don’t think, before last year. I have discovered much, in my new friendship with popovers. Beat together just until smooth: one cup sifted…flour, 1/2 tsp salt, 1 cup milk, 2 eggs. Pour into well greased, deep muffin cups, three-quarters full. 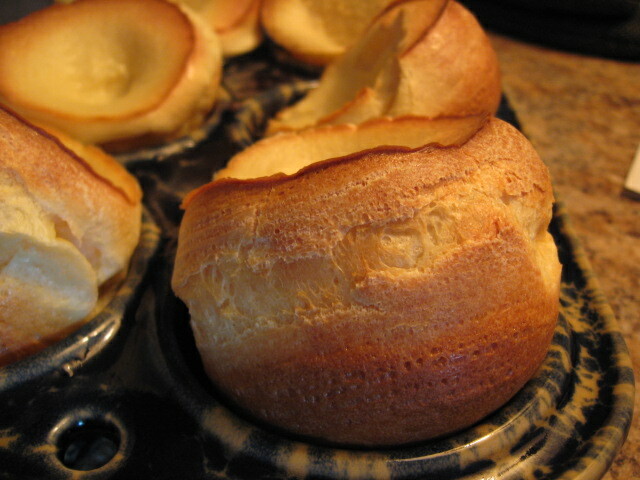 (Oven-glass cups make highest popovers). Bake at 425 degrees, hot oven, until golden brown, 35-45 minutes. Serve immediately. 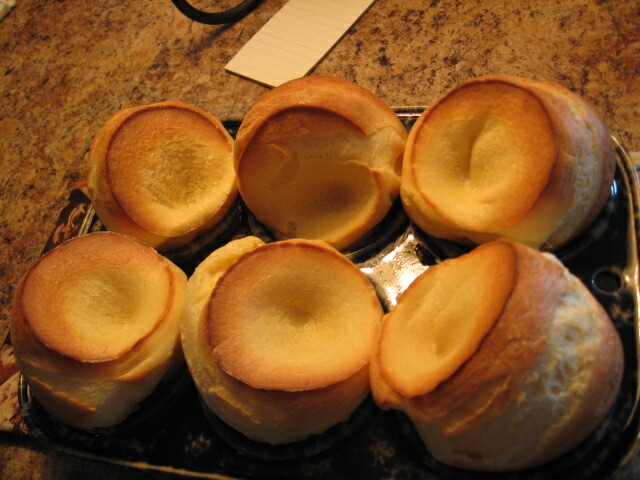 Amount: 5 to 9 popovers, depending on size. It is not necessary to preheat baking cups. An oven light reveals them becoming the “high hat muffins” Betty describes next to her typical mid-century artificially colored photo of breakfast on a red-checked tablecloth. The clock’s slow countdown gives me time to watch and muse. Sometimes the edges pull up in one direction or the other, sometimes they rise evenly–inflating caramel, tan, and white, puffing like out of control teenagers careening around corners, not caring where they spill, yet contained by their individual muffin cup. Bulge, distend, inflate, expand, enlarge, all the synonyms for the process, feel kind of distasteful, instead of the happy idea of claiming volume, having plenty of room. We aren’t supposed to take up too much space, are we? especially women. Popovers stretch out as they heat and settle back in as they cool; it’s not their nature to be tiny, uniform and controllable, and I realize it’s not mine either. 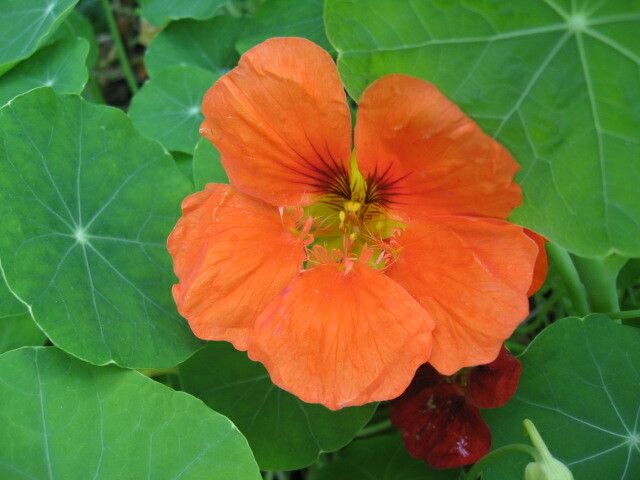 In addition, each one tastes good, regardless of lumpy or cracked shape. Remember that, I tell myself, when you are poking your belly as you look in the mirror. Remember that we all feel good, warm and toasty, to someone ready for our toasty-ness, our hidden steam–and that first person, who should love us best, is our own self. The phrase “muffin top” comes to mind:, we don’t like to spill out, be exposed for our size. Is a muffin top to be ashamed of? When we squeeze ourselves into tight clothes, our softness squished hither and yon, we are measuring against only one standard; I remind myself that muffin cups are there to hold and separate the baked goods, not painfully compress them. All the different ways the popovers rise up makes each one itself. Not that we want to be overly heavy or fool ourselves if we’re being unhealthy. We just want to appreciate our popover-ness, our crispy freshness, our lovely expansiveness. So after the 35 to 45 minutes, at the height of puffy but not to dark brown yet, it’s time to pull them out. They deflate and darken a bit with rest, settle into their-selves, creating a little place for the knife to slide in and deposit butter without too much steam burning fingers. The defined crispy edges, crunchy and chewy to the tooth, lead to an airy eggy center, filling but light enough. I usually add a smear of summer blackberry preserves or honey. After cooking, you have to eat them right away. 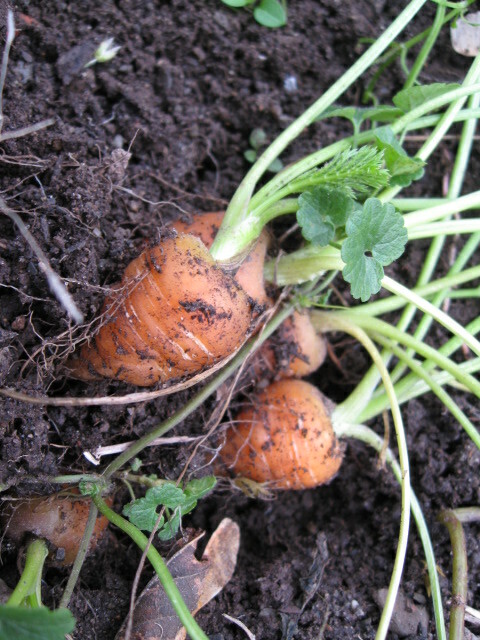 Even an hour later, they just aren’t as tender, tending to be eggier, heavier instead. Precisely because of that short peak, popovers are not popular. I am the first to admit my royal role as Queen of Leftovers, doggy-bagging at restaurants or preparing extra portions so I can have something tasty tomorrow as well as today. Popovers teach me a lesson in Right Now. They only require a few things: flour, milk, eggs, salt. The right kind of pan, a hot oven, and enough time. Blended components change and shift before your eyes, and then you get to savor them in your mouth. On these cold or snowy late fall mornings, you can share the making and tasting with family, a friend, or yourself–good company, all. We, like popovers, are delicious, delicious beings–if we let ourselves be at the temperature we need, for long enough, in the proper container, no more than a few ingredients, then water and oxygen moving in and out with a sense of plenty–plenty of space, plenty of time to be spent on just this one thing, making and eating popovers, making and being ourselves. 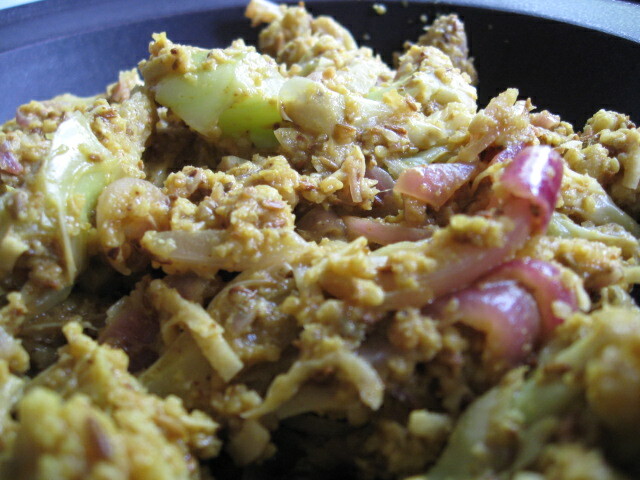 Delightful, savory, just right. Aren’t we all? My fingers are greasy as they strike the keys. I don’t care. I’m using a separate keyboard, in order to keep the new computer pristine, but am compelled to write as I encounter this sensuous, salty, absolutely satisfying sandwich. Such a busy morning I didn’t get to eat! Just drank sweet creamy tea, three sloppy-full tasty mugs of it, to keep me going, as I cleaned the apartment, answered email, and then shopped at the farmers’ market. 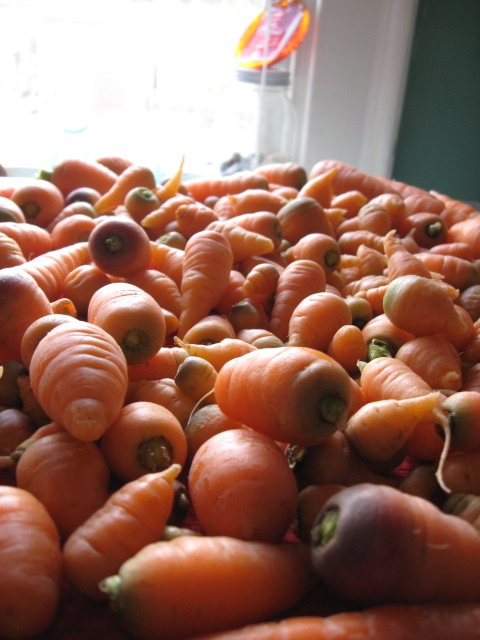 There amid the musicians, neighbors shouting hello, and underlying mumbles of conversation, fall produce called: lacinato kale, arugula, carrots and beets, Asian pears, pea shoots, Chinese cabbage, watermelon-striped radishes, kohlrabi, Candy Crisp apples, all spilling sensually out of bins and bags. I answered the call. Next to the greens table grinned Marjorie, of Argyle Cheese Farmers. Five dollar-bills and two quarters later, a tub of basil garlic cheese curds perched on top of the already over-full grocery sacks. As I stooped to put the package away in the fridge, a quarter-bag of aging rye bread slipped onto the floor. Then a stick of organic butter revealed itself on the top shelf. Oh my. The makings for an amazing grilled cheese. Now when I was a kid it was previously-plastic-wrapped American slices on soft wheat lightly swiped with Parkay; obviously, my tastes have changed dramatically since then. 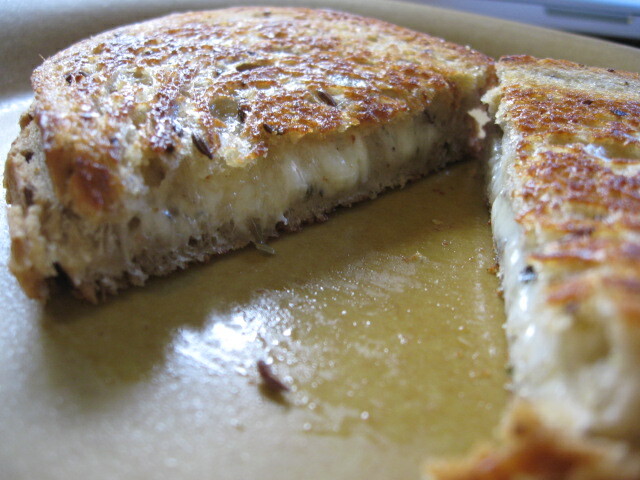 But no matter the formula, grilled cheese is a comfort-food for most people. 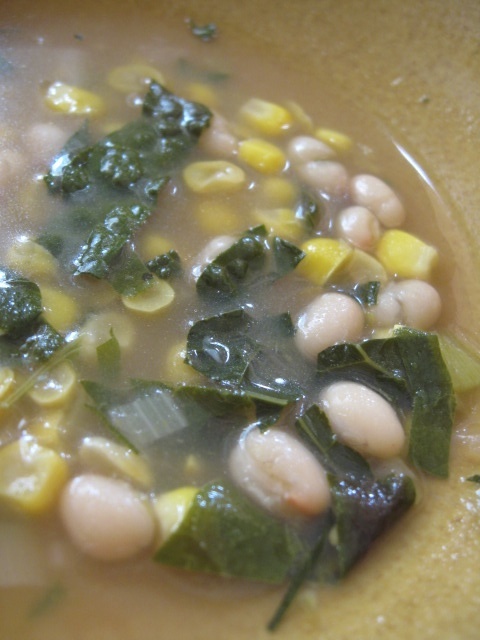 It is warming to the belly, filling, and has that crisp and gooey mouth feel of fat plus starch. 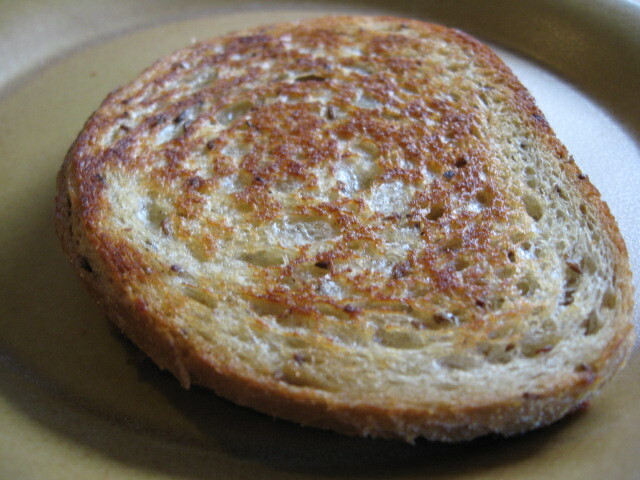 In my childhood, grilled cheese meant mass-production: big pan, two or three grilled-cheeses at once; first, “margarine” the bread (since we didn’t have butter, too expensive), place on the griddle, unwrap the American cheese (usually just one slice per sandwich, two if the family was feeling flush, never three ‘Cuz that’s piggy we were told), place cheese on bread, “margarine” the other piece of bread and top the yet-to-be-flipped sandwich as the first side grills. Watch so it doesn’t burn, but don’t let hunger press you to flip before it’s at least caramel-colored. Before the turn, squash the whole thing with a spatula, to squeeze it all together and melt the American faster. Flip, grill, and then more ingredients just the same way into the pan, until a stack appears, enough for everyone. I like food that brings up the past for people, stories they can tell, parts of themselves to reveal. For example, grilled cheese engenders discussion about “crust or no crust.” Also, how to cut it: two rectangles or four, or two triangles? And what does that present to you, the diner, the devourer; which styling option makes it seem like you have more crust, if that’s what you like? or more squishy middle, if that is your bailiwick? Do you alternate bites of each? 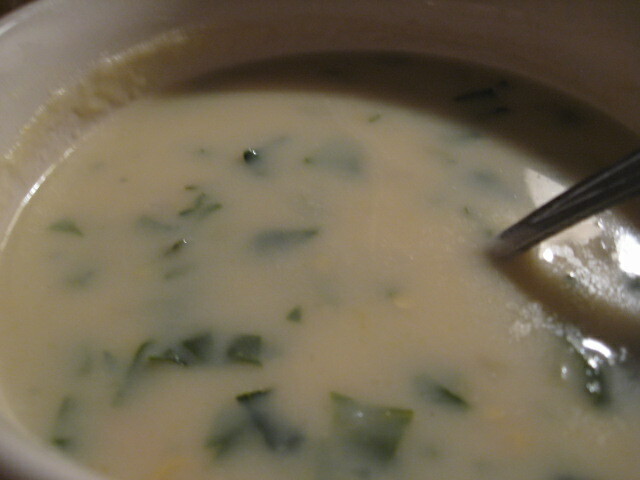 Whom did you consume grilled cheese with; did you munch it with soup and if so, did you dunk it (not me!) or alternate chewing with slurping? I think of other grilled cheeses in my past, and the consequences of bad choices. What happens when you don’t let the muenster melt or give the toast time to color? what about when your attention is divided and the cheese spills out and it burns and the bread blackens in the skillet? Or when you over-apply the butter and it’s slippery to the touch? Or let it sit on the plate too long and then steam sogs the center from underneath? 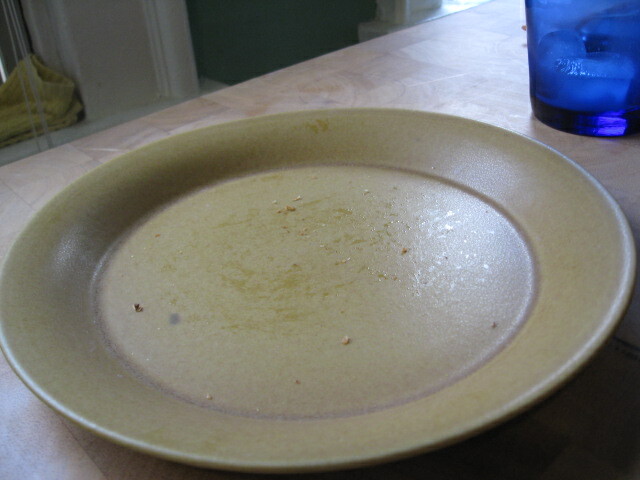 However, there was none of that with today’s grilled cheese sandwich. It toasted to golden perfection, and was yieldingly soft inside. When I crunched past the edges, the sour rye flour and nuttiness of the caraway seeds and salty butter contrasted with the slightly-tart curds and mouth-watering pungency of the garlic and sweetness of the basil bits–a concoction exquisitely paired with an ice cold glass of Battenkill Valley Creamery chocolate milk, bottled in glass and sold to me as I exited the market hours before. Thick and creamy-smooth, not quite a shake, I held the milk in my mouth like a fine wine to absorb the aroma through tongue and nose, and alternated sweet chocolate sips with savory bites of sandwich. So here’s the feeling, when you’ve eaten something so very good–not stuffed yourself, but slowly and wholeheartedly “tucked into it,”–that when you finish, it’s like having run a race, you’re panting with pleasure, amazed that such delight exists in the world and walked into your house and sat down on your plate, begged to be eaten and enjoyed, and you did just that, just now. Thank heavens for that feeling. Thank heavens for cheese curds and butter and rye bread with caraway seeds. Thank heavens for grilled cheese. Just crumbs left, and an empty chocolate milk glass. So tell me about YOUR grilled cheese…. One of several trees that greet you at the entrance to the labyrinth. A meditation labyrinth is a winding path, but unlike a maze, the traveler knows she will follow the course to the center and traverse the same path out with no fear of becoming lost. People have walked labyrinths of various forms for millennia; as they amble, they seek answers to particular questions, or to touch their G/god or Spirit or inner being. When I began my weekend retreat at Kripalu Yoga Center last Friday with a walk in the outdoor labyrinth, I thought about self-definition, and work. Winding the curves, tears dripped down my cheeks: I don’t want to get to the center— because then I will have to come back out, and I’m not sure what I will discover about myself in the process, specifically, my options for future paid work. Recently, before I even claim any idea as a “possible next career,” I’ve gotten scared, run away from thinking, watched too much TV, over-filled the schedule or just done nothing. Achy and stiff, I haven’t participated in my usual yoga classes at home and have avoided extended concentration on breath and difficult positions. Yoga has merely served as a stretching regimen a couple times a week. Last year in the autumn my body was so much more mobile, technically and muscularly strong in the postures, and confident. Lighter, too. Old habits of anxiety haunt me, a drive to squeeze everything I can out of this time away, to find answers to my questions. But at what expense? I ask as I wander. To feel the drivenness more than the experience? I notice that there are more reds in the trees here than in New York; the weeping trees quiver with neon orange, yellow and green in their seasonal change; shadowy evergreens cover the Berkshire mountains behind the labyrinth. Exiting, the view stretches wide, with a broad grassy hill up to buildings where the first session, and then dinner, then more yoga, await me. 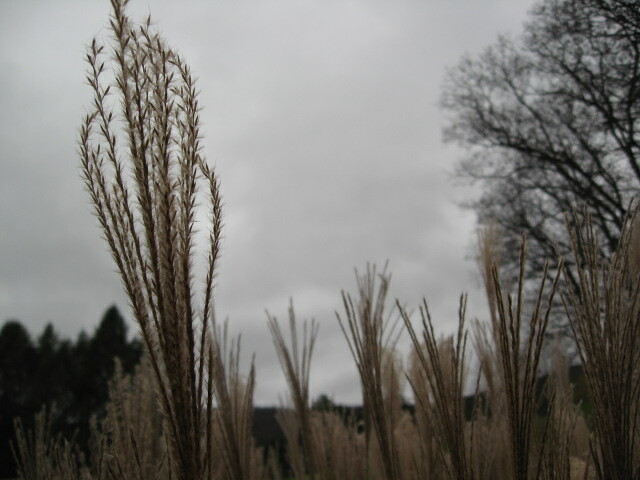 A community of grasses accompanies you. I wish I’d been conveniently struck by some slam-bang inspiration about work while in the labyrinth, but then in yoga class the falsehood is revealed that when you discover something, you are then finished or complete–an impossibility, because we are constantly changing, and the world is constantly changing. The instructor reminded: take your time, make your own choices, move how you want to, experiment! The intense physical activity scrubs me clean and pares me down, open to see daily life as simultaneously not that important and amazingly huge, miraculous, splendid. The sixth sense, we are told, is Awareness. Yoga calls me to the corporeal plane, and the spiritual plane, and beyond that, even–but by 10 pm I am so tired and roiling in self-judgment, it hurts. Washing up before bed, I remember: when my best friend visited a few weeks ago, she commented, You believe you are not moving fast enough with this puzzle. But for the first time in your life you are looking at each piece and not trying to press it in the form right away, instead asking does it fit? does it even belong in this puzzle? I want to trust that the picture will emerge. Mostly I believe it will, but I’ve been sidelined and undermining myself, avoiding “the work thing” because I have been afraid–of failing, or finding a big nothingness at the center of myself and my search. The next day, during the Kundalini yoga, in the repeating pose of punches-through-an obstacle, I strike through the negative messages, through self-doubt into compassion for myself, thus revealing a glorious version of Me. It is repeated: Revelation will come and there will always be more to understand and grow into. As we tell our life stories during lunch, my roommate remarks on my tenacity, and offers unexpected observations about my skills. 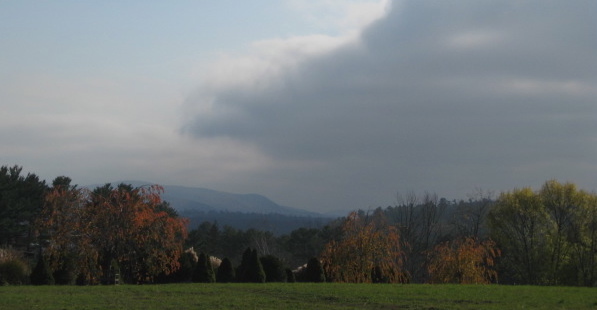 In a Kripalu Yoga session, frank acknowledgment that everyone suffers heart break leads to a vision of the body as energetic river, where damage from that pain has an impact, but can be repaired. Words from the Prana Flow teacher: Move with courage into whatever life brings. Practicing yoga can give you confidence that we know nothing. Spending time with yoga itself will give us “nothing”–but through breathing, doing asanas (poses), and other practices, we can tap into the teacher we have within us. A bit theoretical, hopeful, maybe even too far-out. But I like it. After fourteen hours of yoga in two-and-a-half-days, hours of breathing and meditation and strengthening of the body and compassion toward myself, listening to the body and listening to the body some more, having my value reflected back to me by others and myself–I approach the labyrinth once again, to close the weekend. 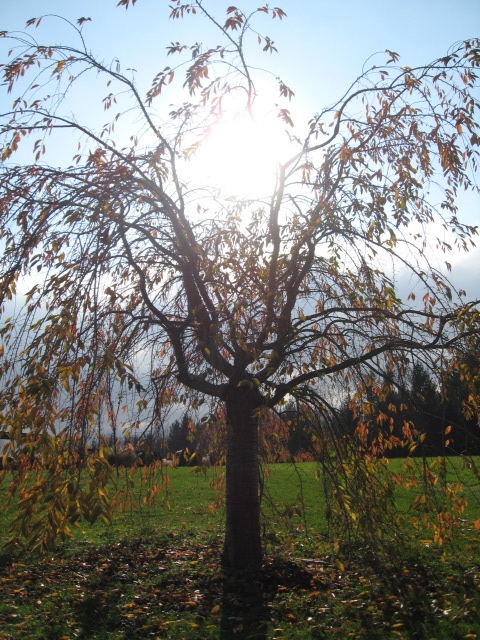 I stop at each planting on the way in: sets of willows, vanilla-cupcake-colored, Seuss-ian tufts of grasses flopping in the wind, and some unidentified saplings; I reach out to touch each one in turn, and step to the next pair, like a slow procession up a church aisle, until I come to the labyrinth entrance, stroke the wood of the arch and walk through. I deliberately slow my gait, returning to the meditative walking that I’ve read about: sense the heel touch the ground, roll through the middle, and let the toes make contact. Then don’t do the expected forward movement, just rest there; then, pick up the other foot, shift weight and move. One step. Pause. One step. Pause. One step. I brush against a bushy bottomed evergreen, and it felt like I was joshing a friend, approaching a teenage boy uncomfortable with hugs, him pushing his shoulder against mine, Hey, dude, whuzzup?, a camaraderie with the trees, like we were buddies, old pals, kidding around with each other, glad to see each other, relieved actually. So I stop to give each head-high evergreen a gentle shoulder bump and a half-smile of recognition. Following that, I tromp, wide-hipped, swinging my legs with energy. Clomp-clomp-clomp. 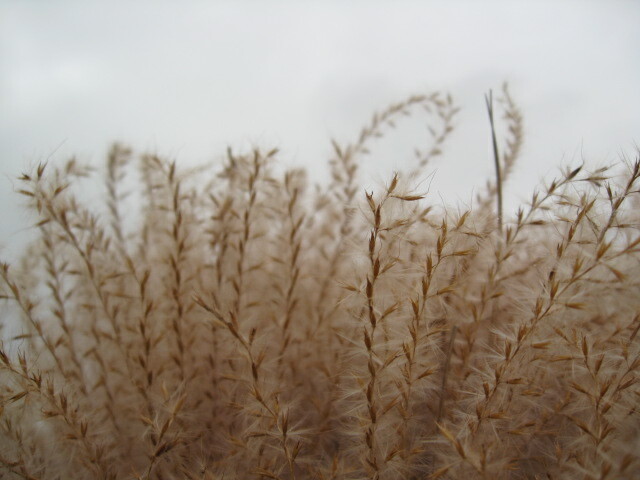 Then stand, smelling the musty grasses dry in their rustling, slipping their feathery lengths through my fingers. Next, glide forward slowly again, with few tears, in fact triumphant, bubbling over some with alternative ideas and ways of looking at Work. Think to myself with a sigh: god knows I will run into obstacles and I may be completely wrong about the possibilities, but I’ll use the yoga practice–no, I’ll just DO it, and through that, trust I will get to know how I feel about things; motivate myself by being in touch with my body–no, I’ll NOTICE motivation and excitement from within, seeing and leaving behind the berating messages, the patterns of avoidance–cleansing with breath, clearing, opening; like the trees are changing and opening to the heavy gray fall sky over lake and mountain here in the Berkshires. I resolve to create a new Practice in my life, instead of the old Routine: new ways of walking through my days and taking care of myself. Cup of hot tea with honey in hand, I drive back home. Of course next day I am exhausted by the weekend, and then overstimulated by classes at the computer store: required to be intellectual before I am ready, blasted by the fluorescent lights, too-loud Muzak, and super-saturated color. The coming rainstorm from Sandy pushes me to watch old episodes of Glee “while I can” and then the darned electricity never goes out! and I worry I have fallen right back into all my old habits. But–every day I’ve eaten well, gone into my yoga room and felt the muscles loosen along with my busy mind, remembered what my community of yoga teachers taught me, heard their laughing voices, and breathed compassion toward myself. Started again with the next moment. Yes, life is a series of beginnings, to be taken puzzle piece by puzzle piece, step by step, breath by breath. Perhaps life is also a series of puzzles, where the fun, the point, is putting it together, not the final image. I am confident I know nothing. I have entered the labyrinth, journeyed to the center, and come back out. I’m holding the puzzle pieces, thinking. A far-away view of the labyrinth, after you re-enter the world.